Our Inside Axon blog series is updated every Wednesday and features letters from executives within Axon. This week's post was written by Bobby Driscoll, Axon's VP of Sales & Support Operations. Check back next week for more experiences and insight from Axon leaders. Axon is a company in the midst of a hyper-growth phase, selling a connected platform of software and hardware products and services to law enforcement. During this time, it is especially important to form a team of high-functioning individuals who are committed to not only doing things fast, but also to doing them right. I oversee Sales and Support Operations, the sausage factory where sales strategy meets training, forecasting, deal execution from quote to cash, and customer retention. Sales and support ops team members know the stakes are high in every prospective deal, so it is essential that we field a team our sales reps trust to get the details right on all aspects of the sale, from RFP responses, to negotiating complex, long-term SaaS contracts, to quick and accurate customer order fulfillment. If one link in the chain is weak, the deal, and more importantly, the relationship with our customers, can be placed in jeopardy. As our work consists of all aspects of back office logistics that plan for and execute upon sales activities, it takes a dedicated, diverse team of individuals to work together to achieve our company's goal of customer obsession, and we have built our sales and support ops team accordingly with varying skill sets. Intellectual horsepower and bias for action are essential qualities in order to thrive in a fast-paced, challenging environment like ours. These are two traits I find in most, if not all, of my colleagues (on every team) at Axon. They are the ones that allow us to grow fast. Really fast. Hiring folks who possess and exhibit intellectual horsepower and bias for action allows us to continuously push for improvements in people, processes, and systems. But this post isn't about those behaviors. The differentiator for sales and support ops is a pass-first mentality. How did the pass-first mentality become ingrained so deeply in my ethos? I was raised in a large family in Greater Boston by two teacher/coaches. They drilled into all ten of us Driscoll kids the importance of lessons learned from team sports. We learned to lose (and to hate it) and win with class. We learned it was okay to see our own blood mixed with a little sweat and dirt, as long as we picked ourselves up again and got back in the game. And, most importantly, we learned that no one great player could defeat a high functioning, unselfish team. “An assist is as good as a goal” was a familiar refrain from my father, and one I took to heart. 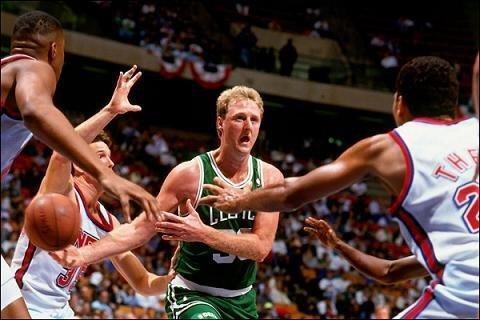 I gravitated toward good players who came together to make great teams — and as a young Boston sports fan, I had many examples of great players who raised the level of their teammates by exhibiting their own pass-first mentality night after night in the old Boston Garden. We have some great players selling our platform on our sales teams. They are a big reason we have extended such a lead in our market. But left alone, without a dedicated team of support staff, the successes would be fewer and smaller. We need persuasive proposal writers, dedicated sales enablement coordinators, tenacious contracts negotiators, eagle-eyed order entry specialists, patient and creative customer support reps, and salesforce admins who never seem to sleep. Intellectual horsepower and bias for action might suffice for the support staff described above, but it wouldn't last and the team would never be “great”. To win deals in a competitive market, we need to move faster, be more flexible, serve our customers better than anyone else. To accomplish these things often requires long nights, ridiculously quick turnarounds, and creative solutions to unique problems on a daily, or nightly, basis. The teammates assisting on these deals don't make commissions, don't earn huge salaries and don't have inflated titles. Don't get me wrong — they want success in their careers and to develop into leaders. But today, first and foremost they want the team, the company, to succeed. These teammates don't care who takes the shot, who gets the goal, they only care that the TEAM wins. It's why order entry stays until every order is cleared every day, why our salesforce admin sometimes sleeps one hour on Sunday evenings, why contracts managers fly to customers' headquarters on the last day of the quarter, and why proposals team members fly responses to customers if necessary. With pass-first mentality, the team wins. It's simple, and we believe in it. Each individual member of our sales and support ops team knows that we each have a varying degree of ownership of the success of Axon, whatever the size of our individual contributions. What we truly take pride in is the success of Axon as we all fulfill our mission together.